Is Cold Brew Stronger than Hot Brew Coffee? 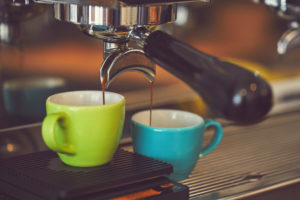 If you’re not a die-hard coffee aficionado or if you’re the type of coffee drinker who would settle for instant coffee in a pack, then you might be surprised to hear that the ice-cold coffee you see at many cafés can actually be made at home. Now you’re wondering about the flavor. You’re probably asking, is cold brew stronger than hot brew coffee? Instead of giving you a direct answer, we’ll give you a complete one. Let’s take a closer look at what cold brew coffee actually is, what the popular brands are, where you can buy it, and how you can make your very own cup of cold brew coffee at home. As the name suggests, cold brew coffee is the type of coffee that you use cold water to brew rather than the traditional hot water. Imagine yourself at home, in the park, or by the beach on a hot summer’s day. You’re craving for a cup of coffee, but drinking hot beverage when the sun’s rays are glaring down on you would be like pouring gasoline on fire. In the past, the only way to make a get a glass of ice cold coffee would be head to the nearest Starbucks or café. Today, simply buy a pack of cold brew coffee at your local supermarket, coffee specialty store, or on the internet, prepare a pitcher and refrigerate overnight. The following day, you’ll have a pitcher of cold brewed coffee just waiting for you anytime you need it. Unlike hot brewed coffee that you just brew in a coffee maker for a few minutes, preparing cold brew coffee will take a lot more time. The first step would be to take the right amount of coffee from the bag. If you purchased coffee beans, you’d need to grind those first. If you bought ground cold brew coffee in a pouch, simply get the exact amount you need, combine it with water in a pitcher, set it aside overnight to let it steep, then strain the pitcher in the morning. You now have a few glasses of cold brew coffee that’s ready for you to enjoy. To ensure that you get the most out of your cold brew coffee, be sure to purchase coffee that was specifically made for a cold brew. You can identify these by checking to see if the packaging has “cold brew” indicated on it. If you enjoy the cold brew coffee of Starbucks or Dunkin Donut’s, you can also buy these brands at their local outlets or on the internet as well. Another thing you’ll notice when you buy cold brew coffee is that some are labeled light, medium, or dark roast. If you have no experience with choosing the type of coffee, it may take some time to figure out what type you prefer. Each type has a distinct flavor, and unfortunately, the only way to find out which type agrees with your taste buds is actually to try them all. However, as a general guideline here’s what you can expect. First, here’s a brief explanation of what these types of coffee are. Roasting is the process of cooking the coffee beans until they reach a certain level of darkness. Light roast has a light brown color to the coffee bean. Medium roast is brown, and dark roast has an almost burnt appearance. If you love the strong bitter taste of coffee, it would be best to experiment with dark roast cold brew first. If you’re not too fond of the strong taste of coffee but love it just the same but maybe on a lighter scale, then medium roast or light roast would be the best options to begin your search. You will also see combinations of light and dark roast. These types also have great flavors, so don’t forget to try them out. When searching for the best cold brew coffee that suits your taste, keep in mind that there are dozens of brands and each brand has a different blend. You’ll need to be a bit patient until you reach the blend you like. But don’t worry, it won’t be too difficult. Rest assured that every brand went through strict quality control before it was introduced in the market. This means that the flavor won’t be too far from what you like, no matter what brand you choose to begin with. The most important point you should remember is that coffee get’s stale quick if you leave the package open. The coffee can also take on a bit of a sour taste if it has been standing around for too long. When experimenting, make sure that you only test fresh coffee beans. If not, you could be missing out on great coffee just because it was on the market for too long before you picked it up. So, is cold brew stronger than hot brew coffee? As you can see, a lot of different factors will influence the answer. In general though, the darker the roast, the stronger it gets. However, this can also change according to the freshness of the coffee, how the coffee was made, and a number of other factors as well. The amount of ice you put in the cold brew can also determine the strength of the flavor. Too much ice and you’ll dilute the coffee, thus ending up with a weaker taste. Instead of trying to figure out what type of brew would be stronger, we suggest that you first find out what type of coffee you want for your cold brew. Once you’ve experimented with several different types and you’ve found the exact brand and roast that suits your taste, it really won’t matter if the cold brew is or isn’t stronger than the hot brew. As long as you enjoy your cup of coffee for that particular time of day, you won’t have to worry about anything else. COFFEE LIFE HACKS: Top 10 Tips for better Coffee at home!